Preheat grill to medium-high heat. Brush peaches with 2 Tbsp. of the dressing. Grill 5 to 8 min. or until peaches are softened, turning after 4 min. Remove from grill; cut into wedges. 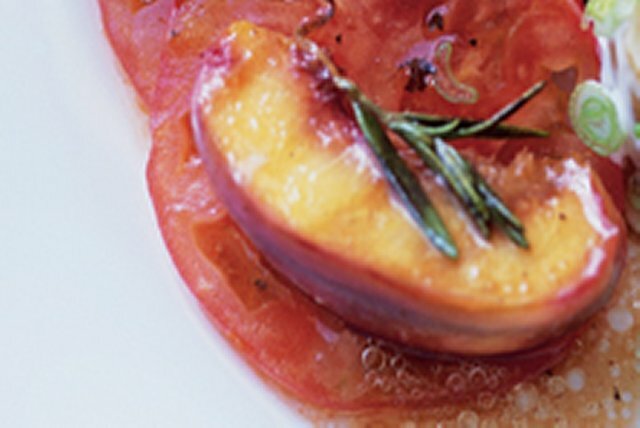 Arrange tomatoes on serving plate; top with the peaches. Drizzle with the remaining dressing; top with rosemary. Look for peaches that are slightly soft with peels that are partially red with areas of yellow in between. Store the peaches, loosely packed in a plastic bag, in the refrigerator for up to 5 days.